First described by W. H. Edwards from a type locality near London, Ontario, this beautiful little hairstreak is very rare and local throughout its range in the high-elevation Appalachian Mountains. Its sole reliable location in Massachusetts is at the top of Mt. Greylock in the northwest corner of the state. Early Hairstreak ranges southward in the mountains to north Georgia, and northward into eastern Ontario, southern Quebec, and the Canadian maritime provinces. In recent years it has been found in several mountainous locations in New Hampshire (W. Winter 1982 specimens, MCZ; Kiel 2003). A hundred years ago, Scudder knew Early Hairstreak only from Mount Greylock, where he had captured it himself in the 1880’s, and from a few locations in Maine (1899: 821). By 1934, Farquhar knew of two more locations in Maine and one in New Hampshire, but no new locations in Massachusetts. There were no, and are still not, any specimens from Rhode Island or Connecticut. After Scudder, Early Hairstreak was not noticed again in Massachusetts for at least 80 years. In 1988, during work on the MAS Atlas, Berkshire naturalist Edna Dunbar walked into the local Audubon office with a small specimen of something that wasn’t in her butterfly guide book. It turned out to be an Early Hairstreak from Mt. Greylock! The re-discovery of this species in the state was a national news media story. Later it turned out that there was a specimen from Pittsfield (Berkshire County), dated 23 May 1966, in the collection of local collector Rene Wendell, Sr., but this had not been widely known. During the Atlas project, Early Hairstreak was also found at five other locations: Florida, Lenox, and Williamstown in Berkshire County, and Bernardston and Buckland in Franklin County (Tyning 2012; LepSoc News 1988; MAS Atlas records; R. Wendell). Another record from Aug. 7, 1987, from Sheffield (Berkshire County), also turned up. American beech (Fagus grandifolia) is the main larval host plant for Early Hairstreak in most parts of its range, including Massachusetts. Beaked hazelnut (Corylus cornuta) is a secondary larval host plant, apparently used mainly by Great Lakes and West Virginia populations (NatureServe 2012; Allen 1997). Early Hairstreak has not adopted any new or introduced host plants as far as is known; both host plants are native. The butterfly is mostly confined to forests with mature beech trees, because the beechnut itself is the larval food (Layberry 1998; Cech 2005). American beech takes 40-60 years to begin producing any nuts at all, and regenerating stands of beech do not provide any immediate habitat. Even in mature stands, good nut crops may be produced only every few years, and Early Hairstreak numbers may be greatly affected by even a one-year failure of the nut crop. Mature beech trees are currently threatened by non-native beach canker (Nectria spp.) in some parts of the butterfly’s range, which presents a potentially serious threat to Early Hairstreak habitat (Schweitzer et al. 2011: 171). Beaked hazelnut sometimes co-occurs with beech in forests, but is also present in drier less dense forests. It is vulnerable to deer overbrowse. Early Hairstreak larvae feed on the developing fruits of beech trees or hazelnut shrubs. They first feed on the seed husks, then bore in to devour the soft young nuts. Several nuts may be required for a larva to mature. The larva pupates in the leaf litter at the base of the tree, where the pupa overwinters. Much of the adult butterfly’s life is apparently spent flying and perching in the tree canopy, and it is thought that its numbers, like those of other canopy-dwelling butterflies, may be underestimated because of the inaccessibility of the canopy. However, dirt roads through beech-maple forests are usually good places to find this species, and ground-level puddling along roads, paths and ridgetops is common in Massachusetts. As Michael Nelson of the Massachusetts Natural Heritage and Endangered Species Program has remarked, the butterflies can be very docile while puddling. On one occasion on Mt. Greylock he watched as a car passed right over a butterfly, which remained happily puddling in the center of the road, oblivious to the passing car. Roadkill can be high, and flattened individuals have been observed on the main habitat road on Mt. Greylock. This road is now closed to vehicles, but this runs the risk of its becoming overgrown and no longer a resource for puddling (M. Nelson, masslep post, Dec. 7, 2008, and pers. comm. 10/1/2012). When its wings are folded, Early Hairstreak can be easily camoflaged when resting on gravel roads: photos from Mt. Greylock in 2011 by Bo Zaremba show this fact, and also a brilliant blue dorsal view: http://www.pbase.com/bo_z/early_hairstreak . Early Hairstreak has remained Rare or Uncommon-to-Rare since its rediscovery during the Atlas years (Table 5). Populations fluctuate from year to year, probably in response to the size of the beech nut crop, but there has not been enough systematic monitoring to establish the timing or size of such fluctuations. Chart 34 shows the highest numbers of Early Hairstreak individuals reported from each site each year 1992-2013. In most years the only location where the species was found was Mt. Greylock. In a few years, singles from other locations have been added to the Mt. Greylock total. The highest numbers ever reported on a single day from Mt. Greylock alone are 29 in 1993 and 20 in 2006. An analysis of MBC records using list-length as a measure of effort found a statistically significant 67% decline in sightings of Early Hairstreak between 1992 and 2010, although with a fairly wide margin of error (Greg Breed et al. 2012). However, many reports of Early Hairstreak were omitted since they were single-species reports, not part of a longer list. Even so, this finding of decline is worrisome, since it fits in with a larger regional pattern of vulnerability and decline, especially in Maine (see below). The Massachusetts Natural Heritage Program lists 1986-2011 records of Early Hairstreak from nine towns: Bernardston, Buckland, Lenox, Becket, Florida, Adams, New Ashford, Cheshire and Williamstown (NHESP, Fact Sheet, M. Nelson 2011). These are all of single individuals only. MBC 1992-2012 records are nearly all from the main location at the summit of Mt. Greylock, in the town of New Ashford. But there are also reports during these years from the towns of Rowe, Heath, Becket, Florida, Adams, and North Adams. These and all the NHESP records are in Berkshire and Franklin Counties. It is uncertain whether the few reports away from Mt. Greylock, all of which are of single individuals, represent new populations or simply strays from the main population. Given that most lycaenids do not disperse readily, it seems likely that some of them are additional colonies of unknown size and longevity (M. Nelson, pers. com. 10/1/2012). Counts larger than one individual are all from Mt. Greylock. The highest Mt. Greylock count in Atlas or MBC years (1986-2013) was 29, on 6/14/1993, E. Dunbar; the next highest count is 20, on 5/28/2006, B. Benner et al. Most recently, 9 were counted on 6/4/2011, 10 on 5/29/12, and 7 on 6/5/2013 by T. Gagnon et al. The MBC 1993-2008 flight chart (http://www.naba.org/chapters/nabambc/flight-dates-chart.asp) shows the primary flight period of Early Hairstreak in Massachusetts to be late May through late June. This largely concurs with the records in the Natural Heritage Program (NHESP) database, although that database also has two records from earlier in May (M. Nelson, masslep post Dec. 7, 2008). Still, the peak flight is always sometime between the last week of May and mid-June. Early sightings: Within the 22-year period 1992-2013, the earliest sighting date is May 9, 2005, in Becket on a road through a beech hardwood forest (R. Laubach) (NHESP database). The next earliest sightings are 5/16/1999 K. Wallstrom, Mt. Greylock (NHESP database), and 5/22/1992 E. Dunbar Mt Greylock (MBC database). The earliest dates in prior years were 23 May 1966, Pittsfield, R. Wendell; and 28 May 1988 E. Dunbar, both cited in the MAS Atlas. Latest sightings: The latest date mentioned in the MAS Atlas account is August 7, 1987, Sheffield R. Wendell. The latest date in MBC records is July 5, 1993, Mt Greylock, P. Weatherbee. NHESP records also include a few more observations in early July. It is unclear whether these are late individuals from the first brood, or a partial second brood. Early Hairstreak normally has two broods south of Pennsylvania. Michael Nelson of the Massachusetts NHESP believes that while there may be occasional second-brood individuals in Massachusetts, they are very rare (masslep post Dec. 7, 2008). Early Hairstreak is listed as Threatened under the Massachusetts Endangered Species Act. Sightings should be reported to NHESP at http://www.mass.gov/dfwele/dfw/nhesp/species_info/pdf/electronic_animal_form.pdf . Collecting is prohibited without a permit. One threat is the loss and fragmentation of mature hardwood forests, usually through timber harvesting or development. Beech bark disease, carried by an introduced scale insect, is another threat (Schweitzer et al. 2011). Other introduced parasitoids and insecticide spraying are also threats (NHESP Fact Sheet 2011). Paradoxically, the gypsy moth may attack and defoliate both Early Hairstreak host plants, but spraying for that moth also presents a threat to the butterfly. Spraying when Early Hairstreak adults are flying, but after plant leaf-out, would present the least threat to the butterfly. In areas where beaked hazelnut is the main larval host plant, deer browse is a serious threat, but this does not seem to be the case in Massachusetts (NatureServe 2012). NO Early Hairstreaks have been found in Maine since 1954, despite the ongoing intensive Maine Butterfly Survey. This is very worrisome since it almost certainly represents a decline, and Maine has been a significant part of the species’ range. Maine could be a harbinger of range-wide decline for Early Hairstreak (Natureserve 2012; Webster and deMaynadier 2005; MBS 2012). 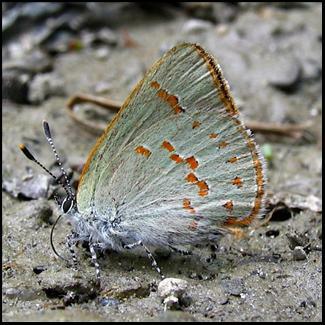 Early Hairstreak is currently a species of Special Concern in Maine. NatureServe (2012) terms Early Hairstreak a “moderately vulnerable” species, and projects a 30 to 70% long-term decline in its region-wide population. And, as mentioned above, analysis of MBC records by Breed et al. finds a statistically significant decline in this species in Massachusetts between 1992 and 2010, most likely due to climate warming. Early Hairstreak may be negatively affected by climate warming in Massachusetts (Table 6). More systematic monitoring surveys of the core Mt. Greylock population are needed.